George Beveridge was a former consultant dermatologist based in The Royal Infirmary of Edinburgh and part-time senior lecturer in the Department of Dermatology, University of Edinburgh. He was to the fore in clinical dermatology in and around Edinburgh for over 30 years. The son of a general practitioner in Saline, Fife, he was educated at Dollar Academy and qualified in medicine from the University of Edinburgh in 1956. During National Service he was posted to the Royal Army Medical Corps as Regimental Medical Officer to the 2nd Royal Tank Regiment based in Munster, Germany. This was a formative time and as part of his ‘medical’ duties he recalled stitching up the Adjutant’s labrador who had been savaged by an Irish deer hound! Towards the end of his National Service he was invited to attend ward rounds at the Skin Hospital in Munster and this may have awakened his interest in dermatology. On returning from National Service George was appointed senior house officer at Ballochmyle Hospital, Ayrshire. Here he was influenced by the physician-turned-pathologist, John Milne (later Professor of Dermatology, University of Glasgow). He returned to Edinburgh as a registrar in general medicine, working under JK Slater whose main interest was neurology. He soon became a MRCP Edin diplomate with neurology as the special subject. He was then persuaded by GH Percival, Professor of Dermatology, to join his department as a lecturer. George was largely self-taught as were so many doctors in those days. He was thrown into the deep end to run large clinics on his own; books came to the rescue more often than advice from his seniors, as asking them for help was regarded as something akin to weakness. He impressed his colleagues, was appointed consultant in 1963 and retired in 1996. Although the hub of his practice was always The Royal Infirmary of Edinburgh, the spokes took him out to regular sessions in peripheral hospitals. These included clinics in Kirkcaldy, Dunfermline, Cupar and St Andrews (until 1971), Leith and Bangour Hospitals (1971–1989) and St John’s Hospital, Livingstone (1989–1996). During his 30 years as a consultant George provided wise counsel to both Professor Hare and then Professor Hunter. He had a steadying influence on poorly considered ephemeral ideas and provided a sound cornerstone to the clinical service. George was, first and foremost, a clinician. There could be few consultants in Edinburgh, if any, who saw more patients in their career. He was a good listener and observer. He was unfailingly polite and his approach was logical and orderly. Patients appreciated their consultations with Dr Beveridge not the least because of his genuine empathy and his avuncular style. He eschewed private practice and became the much-respected dermatologist of many medical colleagues and their families. For many years George provided an excellent histological service for the Department. Taught initially by Professor Percival he developed a keen eye for diagnosing conditions by the microscopic examination of biopsy material. Latterly Dr Kathryn McLaren of the Pathology Department became the mainstay of this service but she liaised regularly with George over difficult problems. 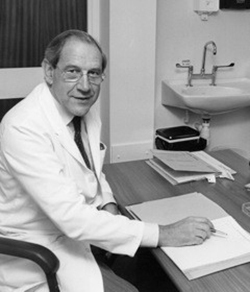 George made significant contributions in clinical research. These were varied and ranged from the first description of skin blisters in patients who had taken an overdose of barbiturates, to the early collaborative publication of the distinctive rash that patients with glandular fever developed when given ampicillin, to the skin problems experienced by renal transplant recipients. George married Janette (née Millar), a fellow doctor, in 1962. Theirs was a long and happy marriage. Outside of work he was an elder at Cramond Kirk, and enjoyed gardening, holidays in Spain and golf, being a member of Bruntsfield Links Golfing Society for more than 50 years. His physical health, but not his mind, deteriorated during 2018 and he died peacefully at Strachan House Nursing Home. He leaves four children and four grandchildren. First published in the Scotsman, 7 November 2018. Republished with kind permission of the authors John Hunter and Iain Beveridge.